After the Armistice Agreement of 1953 a Demilitarized Zone (DMZ) was formed between North and South Korea where both nations has agreed to move their troops back 2,000 metres from the line, forming a buffer zone. The 38th parallel is a circle of latitude that sits 38 degrees north of the Earth's equatorial plane which acts as the original border between North and South Korea before the Korean War. Architecture-research initiative Arch Out Loud organized the concept competition to reimagine this zone of political tension as an underground bathhouse. 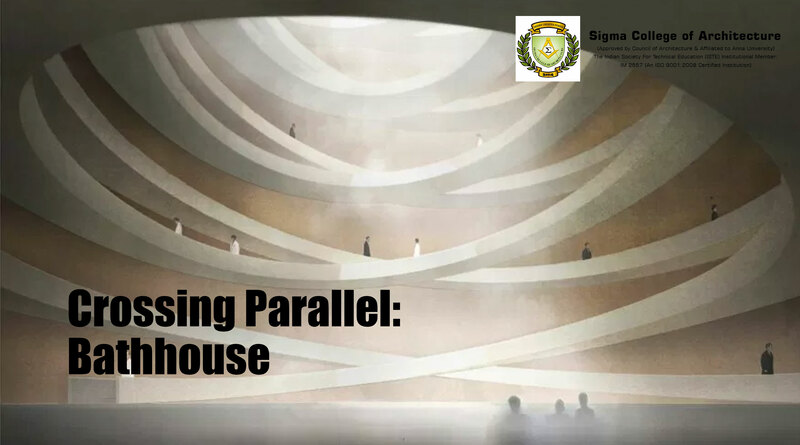 The competition attracted almost 300 proposals and the winning design was by Studio MRDO and Studio LaM for their project on ‘Crossing Parallel(s): Bathhouse’ which consists of a double helical ramps spiraling down towards a communal pool at the bottom of an underground dome. It also consists of an oculus at ground level allows natural light to shine through to the water below. The project tells a story of the relationship of human conditions where the participants would walk along the 38th parallel, entering the theatre via separate entrances. After passing through the checkpoint and changing rooms, they confront each other from opposite sides of the ramp where they would observe each other's feelings, while passing through layers of tension and relaxation.